The golfer needs to think out the information they want to discuss with the club fitter. The club fitter may also have a short form to fill out like the example shown here for a “Personal Interview” which will indicate the golfer’s driver hitting tendencies along with any of their goals, wants and preferences. Also, it is recommended that any golfer wanting to get fit for a new driver fill out 3 or more Driver Score Cards. These cards provide actual playing information which is quickly and easily analyzed to point out the golfer’s possible strengths and weaknesses. However, more importantly, they help with the approach the club fitter needs to take to correct any faults and/or satisfy the golfer’s wants or needs. So, a good, straight forward Personal Interview between the club fitter and the golfer is a necessity for a good driver fitting session. 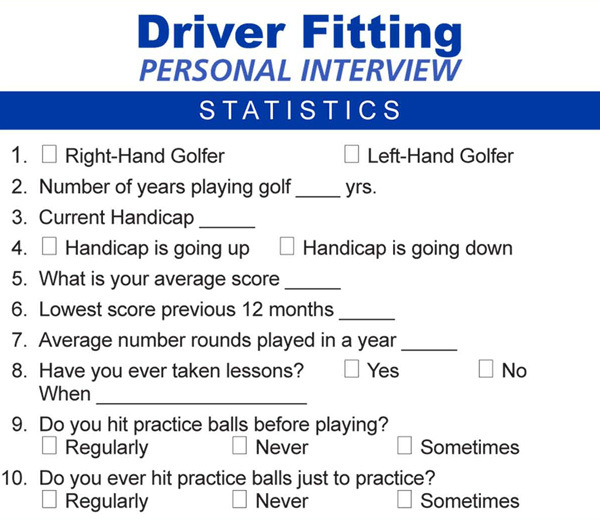 Download or print the Driver Fitting Interview worksheet by clicking the link below.